The first point for me was to ensure the compatibility with LITA. For this, as I don’t want to reinvent the wheel, I decided to test the Paul Robertson’s encryption class and its simple version by David Deraedt. you can then open a database by different applications when you use the hashed key (this is actually just the way AIR works). the same password won’t generate the same hashed key if you use different apps even if the encryption class is the same : LITA, the SQLite Sorcerer in debug mode and an installed version of the SQLite Sorcerer don’t give the same key… this is probably due to the SHA256 class of AIR but it was quite disappointing for a feature I wanted to implement. Or maybe, did I misunderstood something in the encryption mechanism. 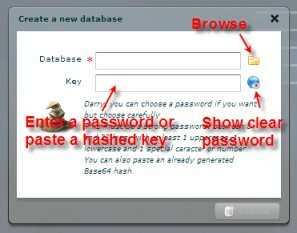 If you want to encrypt the database, so type a strong password. 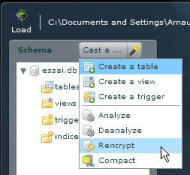 Once you click the Create button, the hashed key is generated and immediately copied to the clipboard. You can paste it quickly into… what you want. The hashed key is also kept by a owl during your work session in this database. So you can click the owl to copy the hashed again in the clipboard, the owl will then vanish. From the popup button in the Schema Panel, just select Reencrypt. In the popup, type a new password or paste another hashed key. If you install a new version of the SQLite Sorcerer (non donators), your strong password won’t work again and you will have to use the hashed key to open the file again. So check your key repository before installing the new version. If you want to continue to use your usuable password, you can rencrypt your db with the new version and update the repository with the new key. Don’t hesitate to send me your feedback on this new feature in the SQLite Sorcerer.